Buy a cheap used sausage machine. Make your offer! 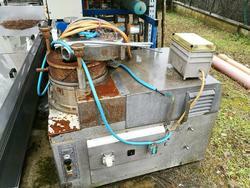 Are you looking for a used vacuum sausage filler? Buy it at auction on Industrial Discount, the reference portal for those looking for used equipment for the food industry. Through the judicial auction sales system you can save a substantial amount on the purchase of a used sausage filler. How is it possible? First of all, you must know that the prices of the lots for sale are significantly lowered compared to their current market value. In addition, with the auction system you are sure to offer only the price you are actually willing to spend. Do not miss the best offers for used sausage stuffers: register to the portal, activate your account and immediately make your online offer! Throughout the auction you can track the bids of other participants and adjust your bidding strategy based on the sales trend. If you don’t find any lot suitable for your needs, don’t worry: by subscribing to our newsletter you can receive our weekly updates concerning our sales of used sausage fillers. In this way, you won’t miss the best savings opportunities!